Tuesday, September 25, 2012 was my last day as an employee of IBM Canada. I have been with company for almost 28 years, and was offered an option for an “early retirement” as an exit from the organization. However, I expect that I will continue to work (and study) elsewhere for at least 10 to 15 years. Since I’m not expecting to draw from the Canada Pension Plan any time soon, the label of “retirement” as applied by the company isn’t the same as that as applied by the government. Statistics Canada has three categories in the Survey of Labour and Income Dynamics. Career employment means having employment income or Employment Insurance (EI) benefits, no pension income and not reporting retirement as the major activity. Bridge employment means having employment income or EI benefits, pension income or reporting retirement as the major activity, and not out of the labour force for more than six consecutive months at the end of the year. 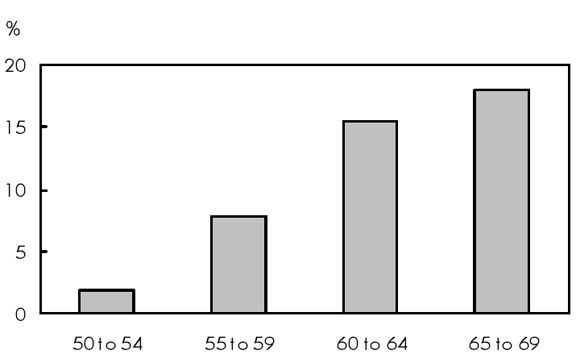 Retirement means having pension income or self-identifying as retired with no employment income or EI benefits, or having pension income or self-identifying as retired with employment income or EI benefits, but out of the labour force for more than six consecutive months at the end of the year [Hébert and Luong 2008]. I don’t intend to take myself out of the work force in the near future. It seems as though it’s not uncommon for retirement-eligible individuals to work. Not only are the numbers of age 50 to 69 individuals active in bridge employment increasing, but so is the proportion increasing with aging of the baby boom cohort. Each of these descriptions has a balance between accuracy and understandability (by the layman). A spin-off is normally viewed in an organizational sense, but there’s little in most definitions that couldn’t be extended to individuals. One description comes from research specifying a base taxonomy. There are two dimensions to categorizing spin-offs: relatedness and integration. On relatedness, success is more probable if the venture is similar or complementary to conditions in the parent. Integration of the venture with the parent is a two-edged sword. Higher integration allows a small organization to lean on the economies of the parent. Lower integration opens up the venture to more readily reach out to parties outside organizational boundaries. Staying quasi-externalized means that they develop an ongoing relationship with the parent firm after the formal separation to secure the continuation of the resource sharing relationship. Resource-based literature suggests that the replication of resources previously provided by the parent firm tend to be slow, due to time compression diseconomies, asset mass efficiencies and asset interconnectedness …. Thus, maintaining collaborative linkages may prevent the negative impacts of the separation, possibly leading to disregard of some previous knowledge …. In the research, three clusters emerged. In cluster 1, the spin-off were engaged in new-to-market technologies, developing ideas and new business areas from outside, eventually bringing them back to the parent. In cluster 2, the ventures used research and development facilities of the parent, and then targeted customers not previously served. In cluster 3, mature technologies were packaged into a distinct organization that were gradually weaned off parent resources. Rapidly separating from a company after a 25-year-plus career as an individual is a pattern most like Cluster 2. If the parent was to serve as a patient investor over a long transition (e.g. IBM’s divesture of the PC Division to Lenovo), that pattern would appear in Cluster 3. In other studies of spin-offs, i.e. from academic institutions, there’s a recognition that human capital can be spun off, just as technologies are spun off. Another point of difference centres upon whether a transfer of human capital must be involved, as opposed to solely the transfer of technology …. The importance of the transfer of human capital is that it embodies the tacit knowledge that accompanies the technology and which is usually important for the development of the technology in the fledgling company. a company formed through the transfer of technology from an R&D company, which is completely independent of the parent company, and involves the transfer of human capital. As an individual, my career at IBM has embodied me with skills, practices and a way of thinking. These all represent passive capital that might be activated (or not) with alternative organizations in the future. The idea of a free agent was popularized by Dan Pink. The old social contract didn’t have a clause for introspection. It was much simpler than that. You gave loyalty. You got security. But now that the old contract has been repealed, people are examining both its basic terms and its implicit conditions. While scheduled training within a day job may seem as a nuisance, a company has an interest in its employees keeping up to date. Outside of corporate structures, individuals have to take more individual responsibility. I’m in the midst of writing my dissertation for the doctoral program in Industrial Engineering and Management at Aalto University. While I’m not otherwise working on projects or looking for longer-term engagements, my focus will continue on writing that. An encore career is a midlife transition to work that not only continues income, but promises personal meaning with a potential for social impact. The idea of an encore career was popularized through Marc Freedman as Civic Ventures, a non-profit organization funded by a variety of philanthropic organizations. I hadn’t heard of this initiative before, and it’s an intriguing endorsement to see U.S. President Obama using the word “encore” in a speech. There seems to be a lot of enthusiasm in the U.S., but I may exhibit more scepticism as a Canadian. Some New Zealanders also have a cautionary view. Phrases such as ‘encore careers’, ‘plowing a lifetime of experience’ and ‘positive ageing’ are used rhetorically to achieve certain ends. While the authors do not question claims about beneficial aspects of such phenomena, they do question the apparent lack of reflection and critique on the generally one-sided positive framing of such terms. These terms thus cry out for a critical analysis of meanings and discourses. As quick summary, the article sees three perspectives. My prior roles in IBM have had income, meaning, and social impact, so I don’t necessarily see that those conditions would change in a second career. In any of the descriptions above, I may expediently use the label of “retired from IBM”, as long as there’s an appreciation that I’m not retired in the industrial age sense. Saying that I’m a “human capital spin-off”, free agent, or on an encore career will probably lead to extended conversations. Davenport, S., A. Carr, and D. Bibby. 2002. “Leveraging Talent: Spin–off Strategy at Industrial Research.” R&D Management 32 (3): 241–254. doi:10.1111/1467-9310.00257. http://dx.doi.org/10.1111/1467-9310.00257. Hébert, Benoît-Paul, and May Luong. 2008. “Bridge Employment.” In Perspectives on Labour and Income. Statistics Canada. http://www.statcan.gc.ca/pub/75-001-x/2008111/article/10719-eng.htm#a2. Opengart, Rose, and Darren C. Short. 2002. “Free Agent Learners: The New Career Model and Its Impact on Human Resource Development.” International Journal of Lifelong Education 21 (3): 220–233. doi:10.1080/02601370210127837. http://dx.doi.org/10.1080/02601370210127837. Pink, Daniel H. 2001. “Land of the Free.” Fast Company. http://www.fastcompany.com/42901/land-free. Parhankangas, Annaleena, and Pia Arenius. 2003. “From a Corporate Venture to an Independent Company: a Base for a Taxonomy for Corporate Spin-off Firms.” Research Policy 32 (3): 463–481. doi:10.1016/S0048-7333(02)00018-5. http://dx.doi.org/10.1016/S0048-7333(02)00018-5. Simpson, Mary, Margaret Richardson, and Theodore E. Zorn. 2012. “A Job, a Dream or a Trap? Multiple Meanings for Encore Careers.” Work, Employment & Society 26 (3): 429–446. doi:10.1177/0950017012438581. http://dx.doi.org/10.1177/0950017012438581.